"Dog gastritis is a general term used to describe a condition where the lining of the stomach becomes irritated and inflamed. The most common cause is a food allergy or from eating something your dog shouldn't such as grass. The irritant, such as the grass or infection inflames the lining of the stomach (gastric mucosa), causing the release of of mediators that cause the secretion of acids and a change in the way the stomach functions. This alerts the center of the brain that stimulates the vomiting reflex. In most cases, the patient will recover in 1 to 3 days after receiving treatment as outlined below. If veterinary care is needed, the Vet will provide anti-vomiting medications, and medications to protect the gastrointestinal system. 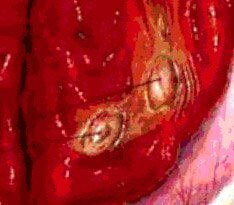 If ulcers are present (lesions or wounds on the stomach wall) they are treated with H2 receptor antagonists. The patient prognosis is based on the cause of the condition. There are two types of dog gastritis; acute gastritis and chronic gastritis. Acute Dog Gastritis: This condition is due to the lining of the stomach becoming irritated. The stomach can be irritated because of something your dog ate (bad food, something from the garbage, feces, grass, bones). The leading symptom is continuous vomiting. Chronic Dog Gastritis: This condition is often caused by an allergy to a specific food. Other causes include hairballs, eating grass and other items that your dog shouldn't eat such as paper or plastic. 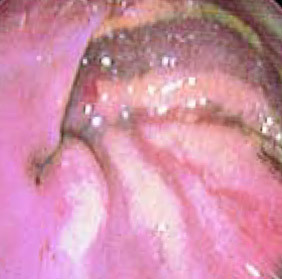 Other types of dog gastritis are hypertrophic gastritis (the membranes in the lower half other stomach become thickened can cause blockage and keeps food from exiting the stomach), atrophic gastritis (thinning of the stomach wall) and eosinophilic gastritis (white blood cells accumulate along the stomach wall. X-Rays are used to diagnosis the condition. A veterinarian will look for a distended abdomen. It is possible that a distended stomach can be hidden by the rib cage. Other signs include fast heart rate (tachycardia), rapid breathing (tachypnea), labored breathing (dyspnea), weak pulse, and pale mucus membranes. 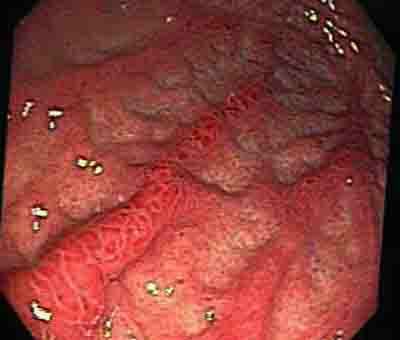 Septic peritonitis: inflammation of the membrane that lines the inside of the abdomen. It is often caused by a bacterial infection. Tests include blood and urine. X-rays are used to examine the abdomen. In some patients spleen torsion (twisting) is also diagnosed. When your dog eats food that is spoiled or eats something she shouldn't such as garbage or grass then your dog can get a condition called gastritis. The most telling symptoms of gastritis is vomiting immediately after each meal. Your dog also will not act herself after vomiting and may appear tired. This condition should go away in 24 to 48 hours by restricting what your dog eats. The goal is to empty your dog's stomach by not providing food for 24 to 48 hours. Provide small amounts of water once vomiting stops. Once the stomach calms down you can start feeding bland foods such as boiled rice and fat drained beef or chicken. Provide very small portions such as 3 to 4 tablespoons every 1 to 3 hours. Add to this water in liquid or ice cube form. Strained baby food is also a good choice. Increase the portion size as long as your dog is holding the food down. If vomiting returns consult a veterinarian. Your veterinarian may recommend using Pepto-bismol or Kaopectate to help the stomach. Only do this under the advice of your veterinarian. If your dog has vomiting or vomiting accompanied by diarrhea and your dog is acting normally, then you can try the advice listed below for stopping the condition. If this does not stop the vomiting, the condition is accompanied by diarrhea and you see blood, be sure to see your veterinarian immediately to avoid more serious problem such as dehydration. Dogs with gastrointestinal bleeding are often hospitalized for testing and observation. The problem will either resolve itself within 48 hours or your veterinarian will prescribe a medication designed to protect the stomach and GI system such as Pepcid or Tagamet. Your veterinarian may suggest a change in diet to a bland diet such as Hill's Prescription Diet i/d. You can also try a diet you can make at home such as boiled rice and cottage cheese (consult a veterinarian for nutritional balance and supplements). You can also try a herbal remedy that supports the healthy functioning of the stomach lining, digestive tract and esophagus such as Natural Moves. 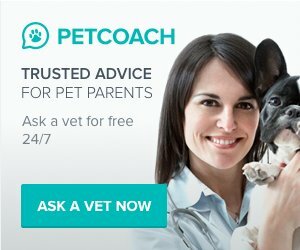 Have A Question For Our Vet About A Dog Stomach Problem? Do you have a question for our veterinarian about a dog stomach problem? Share it and we will answer it for free! Please include your dog's age, breed, medical history and if possible, a picture of the condition.